The Department of Corrections in Washington State has a mandate to foster success through competency, accountability and ethics in the workplace. The state funds and controls prison facilities at the county, state, and federal tiers (Federal Penitentiary at SeaTac). County jails like Ferry County Jail and the Kent City Jail exist to intake pre-sentenced offenders and to manage short-term incarcerations. Whereas state prisons like Airway Heights, Cedar Creek, and the Washington Corrections Center are designed to accommodate more security measures and longer incarcerations. Currently through all facilities, there are 16,488 inmates supervised by 8,870 male and female correctional officers. As the field of corrections evolves toward crime prevention by avoiding re-offense, the federal Bureau of Labor Statistics predicts that there will be an increase of almost 450 new jobs in the industry by the year 2022. If a dynamic career with advancement opportunities interests you, read on for more information regarding the corrections industry in Washington State. 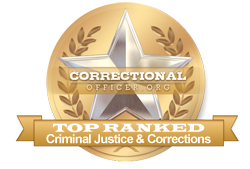 Central Washington University ranks 1st in our latest rankings with 239 students graduating from programs in corrections and criminal justice out of a total six thousand students from the 2012-2013 school year. Saint Martin's University ranks 2nd in our latest rankings with thirty students completing programs in criminal justice out of a total 934 graduates. Pierce College at Fort Steilacoom ranks 3rd in our latest rankings with eighty-three students completing programs in law enforcement administration out of a total 2,782 graduates from the 2012-2013 school year. University of Washington-Tacoma Campus ranks 4th in our latest rankings with 66 students graduating from programs in criminal justice out of a total two thousand students from the 2012-2013 school year. Located in Wenatchee, Washington, Wenatchee Valley College is a 2-year public college with an enrollment of 3,350 students. Offering a variety of certifications and degree options, students choose Wenatchee in order to prepare for career transitions, or to further their education. the Department of Criminal Justice at Wenatchee invites those students interested in a correctional officer career to contact the department to learn more about the combination of practical and academic learning that makes Wenatchee graduates so successful in the workplace. Heritage University ranks sixth in our latest rankings with 12 students completing programs in criminal justice out of a total 612 students in the 2012-2013 school year. Yakima Valley Community College ranks seventh in our latest rankings with 41 students graduating from programs in criminal justice and law enforcement administration out of a total two thousand students. Centralia College ranks eighth in our rankings with 24 students completing programs in criminal justice and law enforcement administration out of a total a thousand students in the 2012-2013 school year. Washington State University ranks 9th in our rankings with 180 students graduating from programs in criminal justice out of a total 13,686 graduates. Seattle University ranks tenth in our rankings with 61 students completing programs in criminalistics and criminal science and criminal justice out of a total four thousand graduates. Applicants whose scores meet the DOC criteria will be invited to enrol in the DOC Basic Officer Training program. Hiring is conditional upon successful completion of the program; candidates who are not successful are not able to secure a position with the state but are welcome to reapply. Washington's State Department of Justice is committed to ensuring growth and development for the state's correctional officers. Median income for this role throughout the state is $46,700 compared to the national median income level of $39,800. According to the employment profile for Washington state, published by CareerInfoNet.org at http://www.careerinfonet.org/occ_rep.asp?next=occ_rep&Level=&optstatus=011000000&jobfam=33&id=1&nodeid=2&soccode=333012&menuMode=&stfips=53&x=70&y=18 state and national trends predict a 5% increase in correctional jobs by the year 2022. In the state of Washington, this nets a positive growth curve of 200 jobs from year to year, both in newly created vacancies and in vacancies from senior officers who advance or retire. The table below lists career information collected by the Bureau of Labor Statistics for correctional officers in Washington. The table is sorted by total employment, with the largest metropolitan areas listed first.